Making you happy, one ice cream at a time. 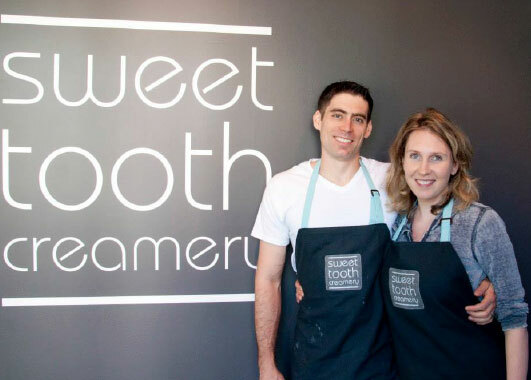 We are Katerina & Erik Steffen, owners of your local Sweet Tooth Creamery! We opened this special store because of our love of ice cream and Osprey Village. We are a husband and wife team that enjoys spending time with our son, whenever we are not working or running the store. Katerina is from Ukraine and speaks fluent Russian. Whenever she has time she enjoys taking her son for a bike ride, walking on the trail around Osprey Village or spending time away from the city with her family. While Erik enjoys family time as well, he also likes hiking and playing hockey. We are well travelled, having visited over 15 countries on 5 continents – our favourite city is Nuremburg, Germany. Come in to try one (or both) of our ice cream favourites! Erik recommends Espresso Flakes and Kat recommends the village favourite, Sea Salt Caramel in a waffle cone! Come in to try one (or both) of our ice cream favourites! The sole purpose of Sweet Tooth Creamery is to promote our beautiful South Bonson community and bring happiness to our neighbors. We strive to provide our customers with whole-hearted service and delicious product so that you keep on returning to our store. We want to make you happy.